I am joining Susan at betweennapsontheporch for Metamorphosis Monday. Thanks, Susan. Check out all the inspiring “before and afters”. My Metamorphosis is easy peasy! I wanted to put something for fall on the family room coffee table … not too elaborate and something that would not take away from my fall mantle (see blog on 10-4 for mantle). 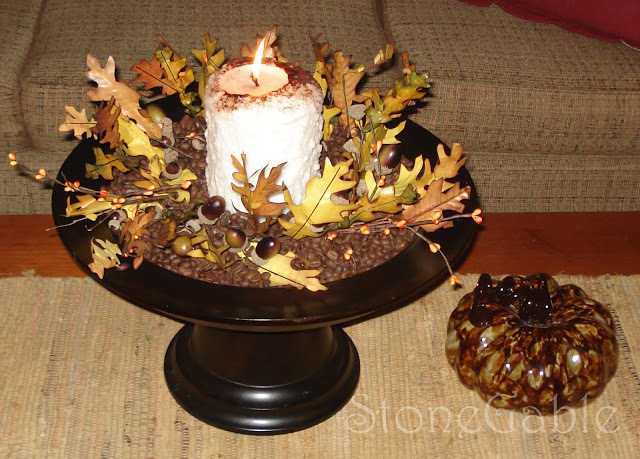 Using a large pedestal from Pottery Barn, a muted leaf and acorn wreath, and a white candle I put together a very easy, no-fuss decoration. Although the elements were nice, it did not look finished. There was too much platform showing on the pedestal. I did not want to buy any other candles or more “fill” so I looked around the house for something interesting to cover the platform. I thought about using candy corn ( been there, done that), acorns and even pebbles. Then came across a bag of hazelnut coffee beans and voila! 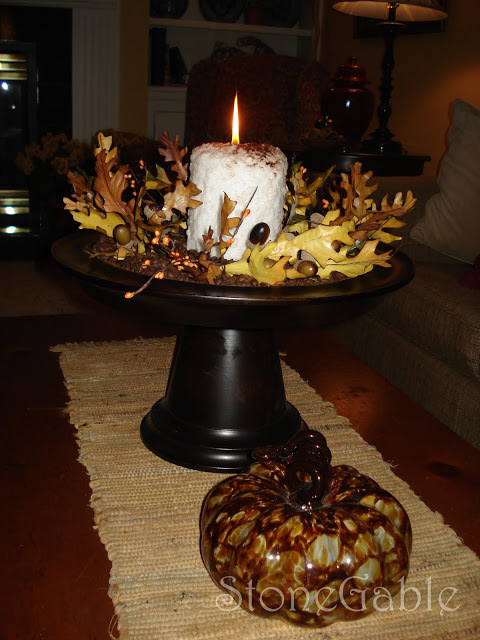 I centered my candle, poured out the beans and evened them over the pedestal platform and fluffed the wreath over it. Simple but much more polished. The BIG, UNEXPECTED benefit is that my family room smells great!!!!! 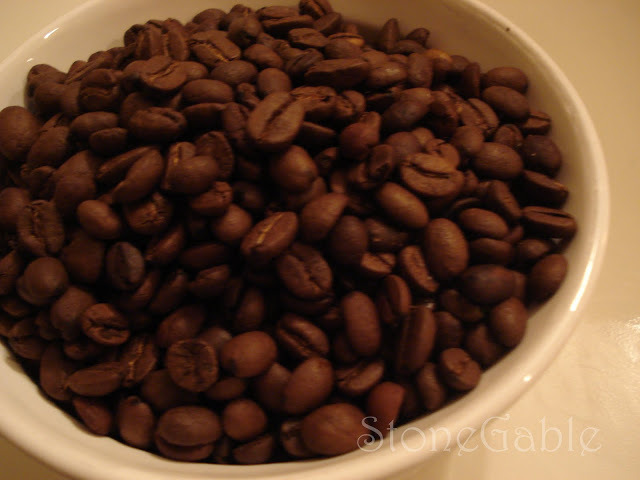 The coffee beans give off a toasty, nutty, and of course coffee aroma. It has been 2 weeks and those little beans are still making olfactory magic. I’ve had a lot of company recently and everyone comments on how great that room smells. Who’d of thought? 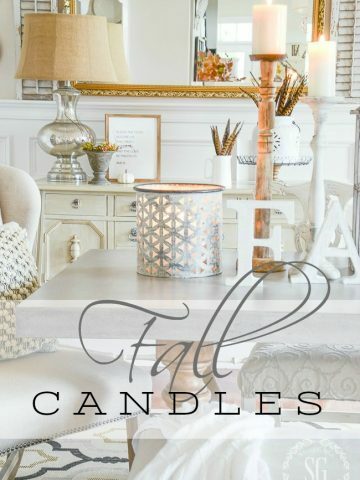 Fall décor with added benefits! What wonderful pictures. Thank you for sharing them with us. Have a wonderful day. What a privilege for me to visit this creative and beautiful blog. I have thoroughly enjoyed this visit and I look forward to more. Thank you for your kind comments on my blog, about the aprons. I have heard very nice things about you and your teaching on Thursday mornings. I am sad that I cannot join you in person, although I often do in thought and prayer. Hi, Yvonne, welcome to blogging! You will love it so much. And I love your coffee table display. 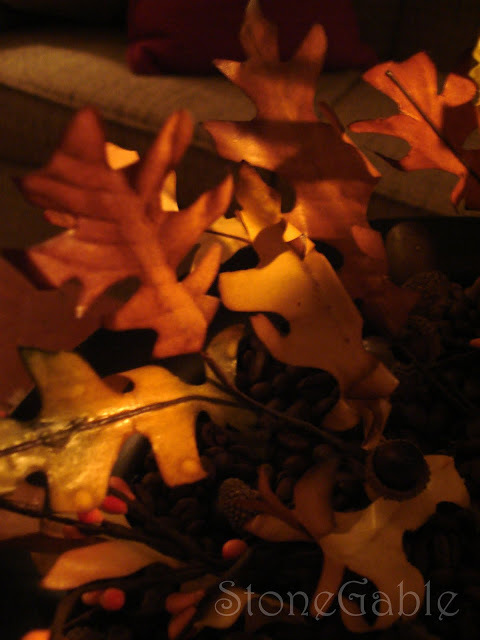 I’ve used coffee beans before when decorating tables at a church event & they are SO great for this time of year. And the smell is just an added benefit. Thanks for coming by & please come back often! Your centerpiece turned out very lovely. And I just might steal your coffee idea. What a great item to use as filler and plus it makes everything smell great. Thanks for the idea. Hope you are having a wonderful evening. Your table display is gorgeous. I have been trying to snazzy up my house with harvest leaves. I love the golden colors. I saw that you were a recent empty nester. I have to tell my sister. I own an online boutique with my sister Yoli, and she is soon to be am empty nester. My kids are still young, so I can’t relate. It was sweet talking with you! Cool idea and love the smell of coffee. I wonder how long the smell with linger!!! Your arrangement looks great. I have used the hazelnut coffee beans with a candle before too. You are so right. the fragrance is fantastic! Very creative project, I love it. Stop by for a visit soon! I just followed you. I can just see that beautiful candle burning now. 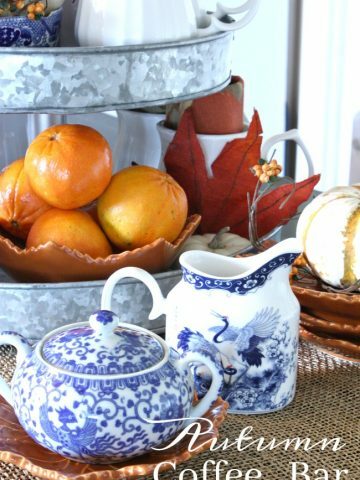 You have got me thinking about Fall decorating. I am in awe of the beautiful pictures of Canada on your blog. The flowers are spectacular. That must have been a marvelous trip. 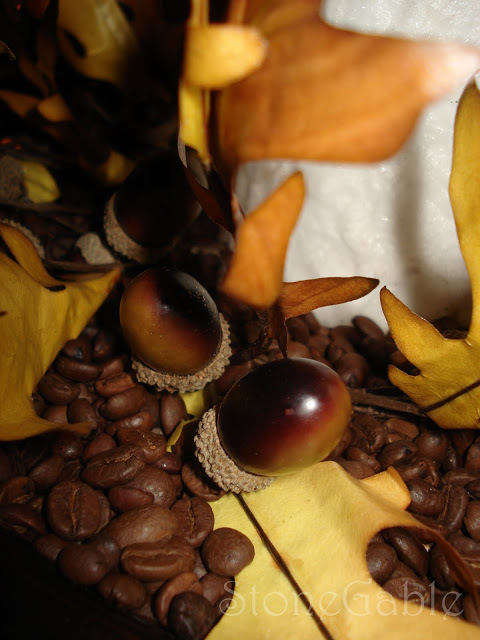 I love the coffee beans, I know they would make the room smell wonderful, but was that acorns I also saw, they are hot hot hot this year and I have spotted them everywhere, I know you knew…loved the pic. Oh, I can just imagine how great it makes the room smell…enjoy! Thanks for sharing, great ideal. I know I would love the smell. Very pretty-brown is so popular right now anyway. My sister has some coffee beans in her kitchen too. I am going to take pictures of her darling home while in KC and post it on my home tour Its So Very Cottagey, probably next Friday the 23rd. And yes they do smell good. I love it! This will be one of my projects this week! Thank you for sharing. Very pretty! I love the smell of coffee beans, too. I can smell it now! What a great idea to use coffee beans! Thanks for the inspiration. Love it, it looks great and probably smell wonderful. Sometimes the simpler the better! 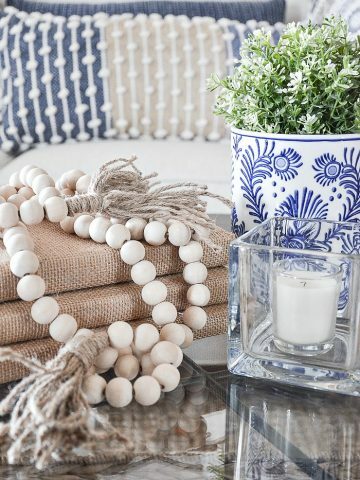 Love that candle. I love your ideas here and your blog is gorgeous.I am so glad I found it. I would really like to also have a go at metamorphosis Monday and your post has really inspired me. Maybe next week if I can get some courage!Best Wishes, NM. What a great idea, and it wouldn’t have to be just for fall. Mmm…I can smell that coffee now. It looks beautiful. Great post and had time to read some older posts…I love your blog…. I have a great giveaway on both my blogs that will be given away this weekend….and all you have to do is comment…….so hope you will stop by.